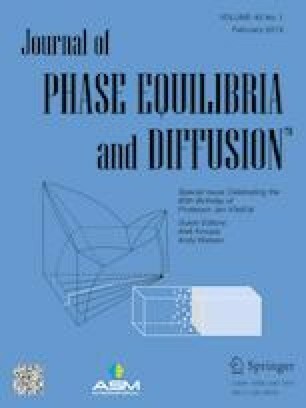 In this work, the phase relationship of V-Si-Y ternary system at 1073 K has been experimentally investigated using the combination of x-ray powder diffraction and scanning electron microscopy with energy-dispersive x-ray analyses using equilibrated alloy method. The existence of eight binary compounds, namely, VSi2, V6Si5, V5Si3, V3Si, Y3Si5, YSi, Y5Si4, and Y5Si3 has been confirmed. Y2Si3 and YSi2 were not found at 1073 K. No ternary compound was found at 1073 K in this system. The maximum solid solubility of Si in the (V) phase is about 4.0 at.%. The range of homogeneity of V3Si was from 20.4 to 25.4 at.% Si. No remarkable solid solubility of the elements in any other phase was observed. This isothermal section consists of nine three-phase regions, 19 two-phase regions and 11 single-phase regions. This investigation is supported by the National Science Foundation of China (Grant No: 51471140) and Jiangsu Province Key Laboratory of Materials Surface Science and Technology, China.